The first of these six coupled locomotives was laid down as lot E839, dated 11th July 1899, at the Hyde Park works of Neilson Reid & Co. in Springburn, being later entered in the firm's order book as "Stock sold to Coltness Iron Coy . .. One side tank engine . .. Boiler complete with certain fittings made for sixth engine of E826 to be used ... Delivery in two months .. . Lord Roberts painted on tank side ... Coltness No. 1 Letter Book 28th January 1903 ... No. 5710." Order E826 comprised thirty goods engines and tenders for the Midland Railway - ordered 8th November 1898, with delivery to commence in May 1899, and to be at a rate of four per month (works Nos. 5572 to 5601, running Nos. 2461 to 2490). At this distance in time, it is difficult to say why a boiler/fittings intended for one of these engines, unless spare or reject, should have been used for what was virtually a freelance design built on spec. No. 1's principal dimensions were 4ft.3in. diameter wheels, 18in. x 26in. cylinders, 30 cwts. of coal (carried in side bunkers). 980 gallons of water, loaded weight of 46 tons 10 cwts. and 150lbs. boiler pressure, but on the maker's diagram "165lbs. = 20,440 T.E." has been pencilled in, together with the back bunker which the engine now carries. Official photos show the name Lord Roberts (the British Commander in Chief during the Boar War) and a works plate bearing the date 1900; presumably the latter was altered to its present 1902 when the loco was purchased by the Coltness Iron Co. After working around Newmains for over fifty years, No. 1 was acquired by the NCB in 1956 and was apparently used at Twechar, as well as at Bedley Colliery, before coming to Falkirk in 1968; one assumes that the headlamp was fitted while at Twechar, as at least one other loco was similarly adorned for working over Baird's former network there. Established in 1837 by Henry Houldsworth at the village of Newmains in Lanarkshire, the Coltness Ironworks did not re-open after the General Strike in 1926, the blast furnaces being dismantled some ten years later, but the company continued with its steel foundry, brick works, cement plant, various collieries (including Duntilland at Salsburgh, Wooded in West Lothian and Blairhall in Clackmannanshire) and controlling interests were acquired in the Warwickshire Coal Co. (1902) with its Coventry Colliery and in the Cumberland Coal Co. (1937). the latter including the Haig pit at Whitehaven. Other subsidiaries were the Ardenrigg Coal Co. ltd., Wilsons & Clyde Coal (and Robt. Addie & Sons Collieries Ltd.) and the Darngavel Coal Co. Ltd. Although the collieries were vested in the NCB from 1st January 1947, the Coltness Co. continued to work the rail system at Newmain, which comprised a line from the ironworks running in a south-westerly direction for some 2½ miles to Overtown Colliery, bridging the West Coast main line and with several level crossings and a branch to Pather, while another line went off westward to Branchal Colliery; latterly this was worked only as far as the Royal George Washer. At one time, also, the Company had running powers over the Morningside and Cleveland branch of the Caledonian Railway. Overtown Colliery was closed in 1954 (later re-opened, it was thereafter served by road) and the whole system had gone by 1963, with the exception of the BR connection at Stirling Road (Morningside) serving the Costain Concrete Co. factory on the site of the ironworks; currently two Ruston Hornsby diesels are employed here. With the No. 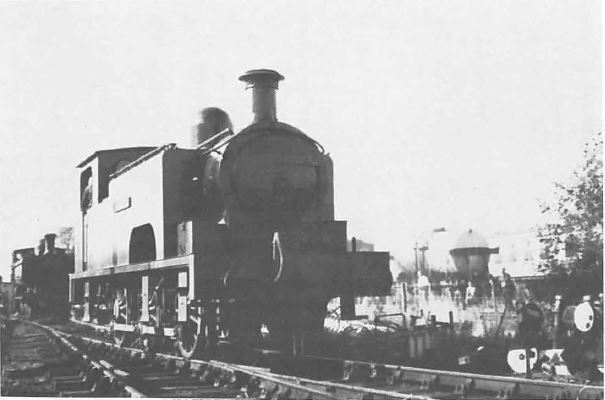 1 evidently proving successful, a second 0-6-0T was ordered from the North British Locomotive Co. (20286/12), as successors to Neilson Reid, on 23rd December 1912, with delivery "five months certain" as Hyde Park lot 545 and was described as "similar to No. 1, but back bunker of 30 cwts. to be added", with coal and water capacity being given as 3 tons and 980 gallons respectively and boiler pressure as 150lbs., with a tractive effort (at 75% cut off) of 18,580lbs. A brass number plate was fitted and the loco was noted (per J F McEwan) in the shed at Newmains as No. 3 in July 1928, but according to the Industrial Railway Society was re-numbered 2 at some time. (A new No. 3 came from Andrew Barclay Sons & Co. Ltd. in 1930 and eventually finished its days with the NCB at Waterside). No.2 passed to the NCB in 1947 and became their Fife and Clackmannan Area No. 27, being employed at Blairhall Colliery until scrapped in 1965. Coltness No. 4 (N.B.L. 24563/39) formed, along with Coventry No. 1 (24564), for the associated Warwickshire Coal Co., order L924 at Hyde Park works, and these two engines were apparently the last industrial steam locomotives built by the North British Locomotive Co. for service in this country, being shown in the firm's order book as "similar to L545", but with 30 cwts. coal capacity, 985 gallons of water and a weight in working order of 48 tons 4 cwts. The Coventry engine having its boiler pressure increased from 160lbs. to 180lbs. and being fitted with a cast iron bufferbeam "in order to increase adhesion", which gave a tractive effort of 22,297lbs. as against 19,820lbs. for the Coltness engine. Ordered on 29th October 1938, they were delivered on 27th May 1939 and bore a close resemblance to the earlier pair. No. 4 appears to have spent its entire working life at Newmains, where its companions included an 0-6-0 saddle tank built by Sharp Stewart & Co. Ltd. for the Barry Railway, and was sold to E G Steele & Co. ltd. of Hamilton in 1963 for scrap. Coventry No. 1 has, however, had a more varied career and was purchased from Newdigate Colliery, Bedworth at the end of 1970 by the Quainton Railway Society and, after an overhaul, was returned to steam in October 1972. Now fitted with the vacuum brake and painted blue with black boiler and scarlet wheels, I saw it last August Bank Holiday giving train rides in the yard at Quainton Road station with a GNR six-wheel brake third, LCDR four-wheel first and LNWR passenger brake - this somewhat bizarre ensemble being rounded off by a female driver! The text in this Quainton Railway Society publication was written in 1980 and so does not reflect events in the 30+ years since publication. The text and photographs are repeated verbatim from the original publication, with only a few minor grammar changes but some clarifying notes are added if deemed necessary. The photos from the original publication are provided as scans in this internet version of this long out of print publication.